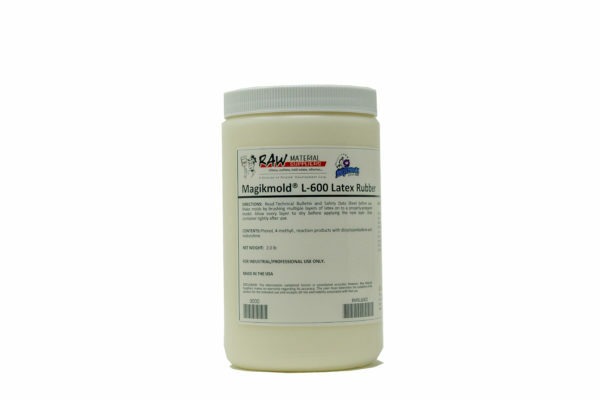 Magikmold® L-600 Latex Rubber is a natural, one-part liquid that can be used to make tough, flexible molds. Magikmold® L-600 Latex Rubber is a natural, one-part liquid that can be used to make tough, flexible molds. Molds are made by brushing multiple layers of latex onto an original model – these layers air-dry to form a thin, blanket mold (usually 1/4″ to 1/2″ thick). Once the mold is completely dry, a supportive mold shell can be constructed – common mold shell materials include plaster and resin. Latex molds are most often used for casting concrete and plaster. Some resins can be cast in latex molds with a suitable release agent; however, the yield may be limited. SHIPPING: Latex cannot be shipped in temperatures near or below 32°F. Please call Raw Material Suppliers Customer Service (877-RTV MOLD (788-6653)) for information on expedited shipping options.